What is the Collectors Club? Since setting up Tommy’s War in 2011 I’ve seen the range and number of customers grow significantly. It was apparent to me that many of the people who buy Tommy’s War products buy on a regular basis, so I wanted to find a way of rewarding those people and to make them special. Modelling is a small market and I’m pleased to say that I know many of my customers personally, and have been fortunate enough to meet them. I see many of my regular customers as friends rather than just names on a spreadsheet, and I wanted to make them feel welcomed and wanted. What benefits do I get being in the Collector’s Club? 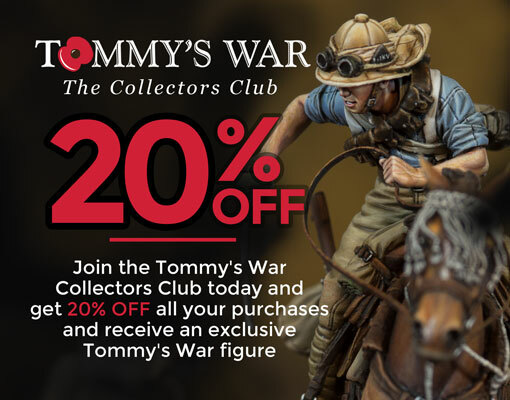 The first one is the 20% discount on all products purchased from Tommy’s War. Now, I’ve already been asked what this means, but in summary it means 20% off any product from the website excluding postage costs. The same applies to any product purchased from me mail order or at shows (Euro Militaire etc). The second benefit is that all members will be sent a Tommy’s War exclusive figure. Due to customer requests I’ve now added an option where you can select the 2016 special which was a Sniper, or the 2017 which is a Household Cavalryman, but please note you can only select one figure for each membership you purchase. Further benefits will be a Membership pack, a quarterly newsletter and copies of the Tommy’s War catalogue as they become available. Will the Collectors Club membership figure only be available to members? Yes, absolutely. The figure will be unique and I will cast as many as there are members. It will not be available to anyone outside the membership. Will the Collectors Club figure be sculpted by Nino Pizzichemi? Yes, it will be a 1/32 figure, cast in resin and sculpted by Nino to fit in with our existing range of figures, the figure comes with a unique and collectable card. What will the exclusive figure for 2017 be? The figure will be selected from a shortlist of 6 figures by Collector Club members. The figure will be announced very shortly. What is the cost of the scheme? The scheme is £25 for customers in the United Kingdom, £30 for customers in the European Union (excluding the UK) and then £35 for customers living outside the European Union. I live in the USA, why is it more expensive for me? Simply the postage cost to send quarterly newsletters and the exclusive membership figure by post. How do I apply my discount to orders? When you join the Collectors Club you create an account, when you log-in again your 20% discount will show on the products. How long does the membership scheme last? The Collectors Club membership is 1 year from date of joining. What are you planning to release? I’ve got two figures that I’m preparing to sell early in 2017 and three to follow closely behind. I’m hoping to release in the region of 10 figures in total. To put that in to context, if you were to purchase all 10 you would pay 10 x £16, £160.00. If you purchase a membership then you will receive 20% discount, £32.00. So if you’re in the UK and your membership is £25 you cover the cost of that, get an extra £7 and then the exclusive figure and newsletters cost you nothing! It really does pay to join the Collectors Club! No, not at all. Anyone who knows me knows that Tommy’s War Limited isn’t a traditional commercial business. I work full-time and my salary pays my mortgage and bills. Tommy’s War is something I do for pleasure and building the brand is far more important to me than profits (although some profit would be nice!). I’ve never taken any salary out of Tommy’s War and everything that comes in goes on new sculpts and ranges. So, the Collectors Club is a genuine effort from me to reward the most loyal of customers and friends.